We are happy to introduce Professor Stephen Goldup as Chemical Science Associate Editor, handling submissions in the area of supramolecular chemistry. 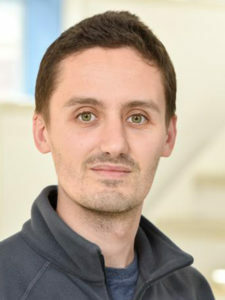 Steve obtained an MChem degree from the University of Oxford where he began his research career with a Part II project in the group of Sir Prof. Jack Baldwin. He continued his research training with a PhD in natural product synthesis under the supervision of Prof. Tony Barrett before shifting focus to apply his synthetic skills to the realisation of mechanically interlocked non-natural products during post doctoral work with Prof. David Leigh at the University of Edinburgh where in 2007 he was appointed as Fixed Term Lecturer in Organic Chemistry. In 2008 he moved to Queen Mary with the award of a Leverhulme Trust Early Career Fellowship and in October 2009 he was awarded a Royal Society University Research Fellowship. In October 2014 the group moved to the University of Southampton where Steve took up the position of Associate Professor. In August 2017, Steve was promoted to Professor of Chemistry. Research in the Goldup Group focusses on the synthesis of novel mechanically interlocked molecules and their application as sensors, catalysts and materials. Steve is keen to receive submissions in his area of expertise, particularly in supramolecular chemistry, interlocked molecules, molecular machines, stimuli responsive systems, and sensing. Below is a list of Chemical Science articles which Steve would like to highlight – all free to read! We hope you enjoy them.